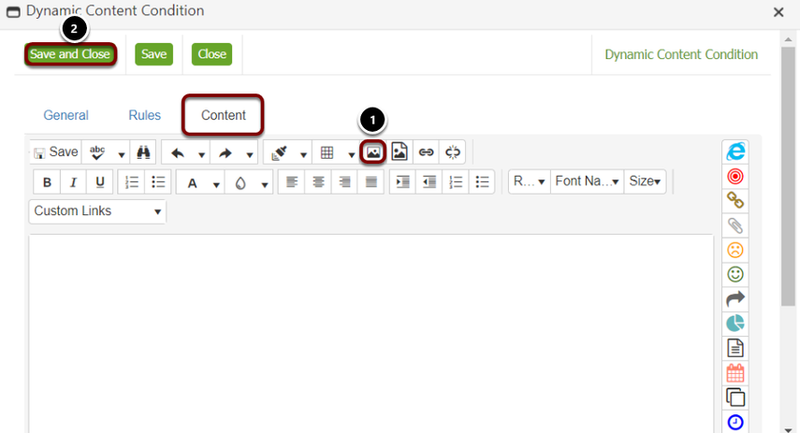 Inserting images as a dynamic content block is the same as inserting any dynamic content. The rules will differ depending on how you want the image to display and under what conditions. This is an especially useful tool if you want to have an image display depending on the recipients account manager, or another field in their contact record e.g. FootballTeam. 1. Place your cursor where, in the email, you would like your image to appear to the recipient. 2. Select the cog icon. This will launch the Dynamic Block Editor. 1. Provide an identifier for your image. This will only be seen by yourself and will not appear in the final sent email. This should be something which will let you know what the block is for e.g. CompanyLogo. 2. In order to create your image rule and attach the image, you first need to add a condition. The General Tab needs to be filled in first. 1. Provide a description for the rule. This will be something identifiable to you. 2. You also have the option to set this rule as the default if the recipient doesn't have data in the field you are using. This will ensure that every recipient has an image and not a blank box. Adding a rule is essential to ensuring your dynamic image works correctly. You can have multiple rules if you are using more than one contact field for example. Once you have selected 'Add Rule' the rule condition set up will appear. 1. Add the attribute you wish the rule to be based on. In this case I want the image to change depending on name, so FirstName is used. Please Note: The contact field must be created in order for you to use it in a dynamic block. This can be created under Audience -> Contact Fields. 2. Add an operator. This determines how the rule works depending on the attribute being used. In this example I want the data in the contact field to be exactly the same as what I put in Value. Therefore I am using Equal To. 3. Enter the value you want the image to appear for. In this case it is a first name. 1. Select the Image you want in the Content tab. You can add formatting and extra design in this screen also. 2. Once you are satisfied, select 'Save and Close'. 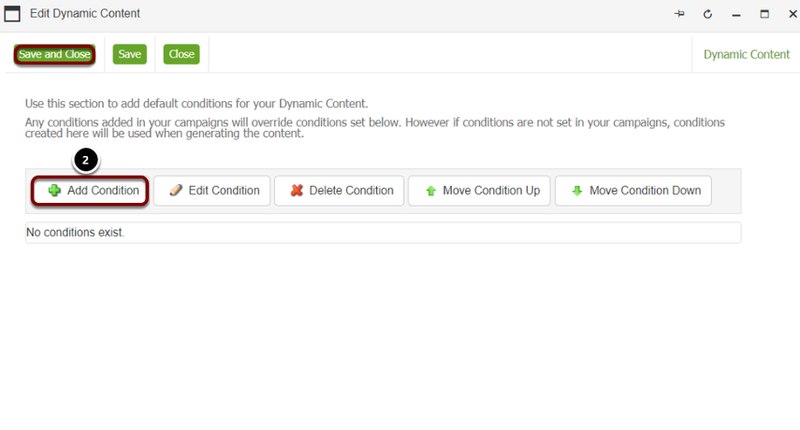 You can preview your rule when you are taken back to the Dynamic Content dashboard. The rule states that IF the contact meets the image rule for the contact field, then the image appears. Clicking the magnifying glass will bring up the image you have added. Once your dynamic block has been created it will appear in the email design above as a blue box. When you test your email ensure that you have information in the contact field the image rule applys to, or the image will not display. We recommend testing it with two or more test emails just to ensure that the content changes depending on the value in the contacts field.